Manager’s Agenda #6. Transmitting Communication from Louis A. DePasquale, City Manager, relative to the appropriation of $50,000 from Free Cash to the Public Investment Fund Public Works Extraordinary Expenditures account for expenses associated with the introduction of commercial recycling expected in FY19. As the Manager’s note says, "The funds will be used for the purchase of recycling bins and outreach efforts associated with the launch of the program. It is expected that the program will begin in the fall of 2019 and will service up to 150 small businesses." A recent message from the City’s Economic Development Division (CDD) invited businesses with 50 Full-Time Equivalent (FTE) employees or less to apply for a lottery to be part of this pilot: "If selected for the Small Business Recycling Pilot, businesses will receive free collection of up to three 65-gallon carts of recyclables twice per week. Please fill out the Small Business Recycling Pilot lottery form at Tinyurl.com/SmallBizRecycle (deadline Aug 10) to be considered for this free service." There are preferences for various things: women or minority or Cambridge resident-owned, not a "formula business", primarily retail or restaurant. It will surprise no one to learn that I have a special fondness for all of the people who work in the Cambridge Election Commission office, and that especially goes for Ginnie Kelley. Her combination of expertise, helpfulness, and especially her sense of humor always helped make my frequent visits to the office a pleasure. While the Big Belly units do hold a lot more and have the added advantage that they can be remotely monitored, the entry chute is the weak link. People frequently overstuff the chute and jam it and others then just cram the jam with more rubbish. They can often be found overflowing more than an open-top container. The design needs further revision to minimize/prevent jams. It may also be worth considering Big Bellies for recyclable materials, but these units don’t come cheap. Communications & Reports #1. A communication was received from City Clerk Donna P. Lopez, transmitting a communication from Councillor Kelley, transmitting memorandum regarding Gun Violence in Cambridge. The subject of this Order may well be the single most pressing current issue for those of us who live in the eastern half of the city. Cambridge political people love to invoke the word "emergency" to justify various policies and initiatives, e.g. "housing emergency" or "climate emergency", but the term is unevenly applied. A dramatic increase in gun violence, like a major fire, is an actual emergency that warrants immediate action and not just long-term policy changes. As the map in Councillor Kelley’s memo indicates, this is a relatively localized problem – at least for now. Committee Report #1. A communication was received from Donna P. Lopez, City Clerk, transmitting a report from Vice Mayor Jan Devereux, Chair of the Transportation & Public Utilities Committee, for a public hearing held on June 5, 2018 to discuss car sharing. The information requested in the Order should be interesting. I often wonder what the transportation landscape will be ten years from now. Private ownership of motor vehicles will likely drop considerably (and driverless vehicles may become common), but unless a miracle happens this likely won’t lead to a dramatic increase in the use of transit (buses and trains) because of the inherent limitations of routes and capacity. The exception will likely be for longer trips. Weather, commuting distances, cargo limitations, convenience, and comfort will limit how many people eventually use the bicycle as their main transportation mode. Ease of access and lack of route limitations will likely lead more people to access their transportation by pressing a few buttons on their phones. We’re already seeing significant increases in Uber and Lyft (often with unskilled/lawless drivers) as Zipcar (now a subsidiary of Avis) and other car-sharing options seem less attractive. I’m not really sure what the intention of this Order is. If the City is redesigning a playground or restoring the Cambridge Common (recently completed), must the City require a hearing for each tree that is removed in addition to the extensive public outreach that projects like these invariably provide? Communications & Reports #2. A communication was received from City Clerk Donna P. Lopez, transmitting a communication from Councillor Zondervan, transmitting memorandum regarding recommendations for the Urban Forest Master Plan Task Force. From the City’s website: Tree Canopy in Cambridge, MA: 2009-2014 – Through high resolution imagery and LiDAR it was determined that a 2% decrease in tree canopy cover has occurred between 2009 and 2014….. Overall there has been little net change in tree canopy within Cambridge. The low amount of net change in tree canopy masks the dynamics that have occurred during the 2009-2014 time period. Over 200 acres of tree canopy were lost. Fortunately, this loss has been largely offset by new growth and tree plantings….. 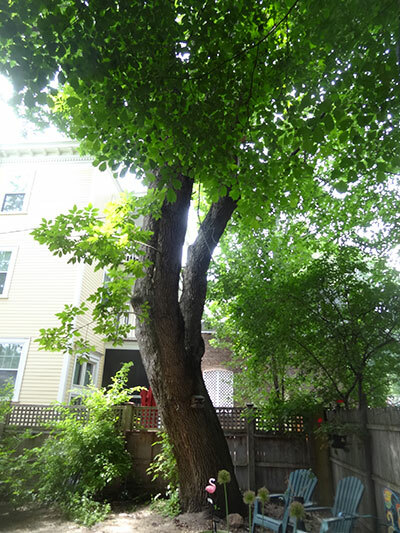 Although tree canopy change in the city of Cambridge has been relatively slow, it is important to note that significant changes in tree canopy do occur. The best way for a community to increase tree canopy is to maintain what it currently has. Existing tree canopy helps to support both natural growth and natural regeneration. Removals of tree canopy, particularly in large quantities, pose a threat to Cambridge’s green infrastructure. Councillor Zondervan quibbles about the percentages quoted in the report. He argues that it’s really a 6.7% decrease rather than a 2% decrease, but that’s really just a choice of denominator. Both are valid perspectives. If a baseball player was batting .300 (that’s baseball-ese for getting a hit 30% of the time), and his average dropped to .280, we’d say that he shaved 20 points off his average (now 28%) – a 2% drop. The Zondervan percentage would be 6.7% – a "batting emergency". Regardless how you choose to measure canopy loss, the crux of the Order is a proposal to require property owners (and not just "the big guys") to seek and obtain a permit before removing any "significant" tree and fully documenting any such removal. It would be one thing if this was a notice requirement for such a removal which might precipitate a negotiation between a property owner and abutters, but this is a permit requirement. There is also no mention of who would have standing in any proceeding relating to the granting of a permit. Not to be alarmist, but some may remember the term "removal permit" from the days of rent control when, in fact, obtaining a removal permit was essentially impossible in the political climate of the day. Committee Report #2. A communication was received from Paula Crane, Deputy City Clerk, transmitting a report from Councillor Quinton Zondervan, Chair of the Neighborhood and Long Term Planning, Public Facilities, Arts and Celebration Committee, for a public hearing held on May 15, 2018 to discuss the proposed Cambridge policy relating to the sale of adult-use cannabis. I appreciate your comments on Order #4. A sense of urgency is warranted, especially as the school year finishes on Friday, June 22, and we move into summer. As a city, we need to do all that we can to protect neighborhood residents. Parents should not be living in fear. Let’s put all hands on deck and target support for the Port. Might disagree on Order #12 after all. homes nearby, I’d be against that. a number of times over the years. a tree in a public space sometimes.